Kerala Ayurveda MurivennaThailam is a medicated ayurvedic oil formulation used for the skin diseases, cuts, wounds and ulcers. It promotes quick recovery from the fresh as well as chronic wounds and ulcers. In addition, it is also useful for relieving pain and lowering inflammation associated with arthritis, sprains and fractures. It is also beneficial in cases of non-healing ulcers and diabetic foot ulcer. 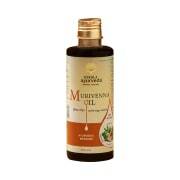 A licensed pharmacy from your nearest location will deliver Kerala Ayurveda Murivenna Thailam. Once the pharmacy accepts your order, the details of the pharmacy will be shared with you. Acceptance of your order is based on the validity of your prescription and the availability of this medicine.